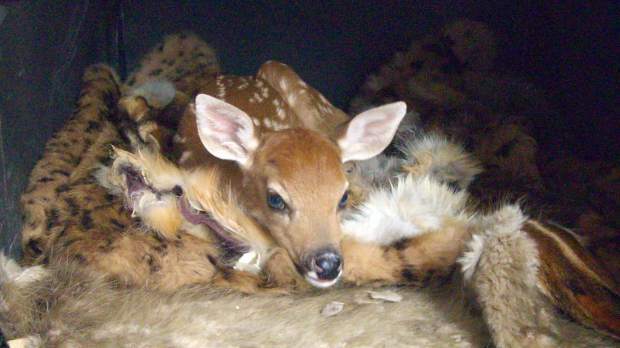 Fawn on furs (Wet Mountain Wildlife). M. and I swung through Pueblo last week on a typical supply run and picked up some fur coats — one rabbit, one mink. They are for the bears. Or the fawns. Or whatever other young animals turn up at the wildlife rehabiltation center west of town later this spring. A program called "Coats for Cubs," run by resale clothing retailer Buffalo Exchange, collects unwanted fur coats for rehabilitation centers nationwide. To celebrate a new year and a new you, donate fur to Coats for Cubs! From January 2 to April 22 (Earth Day), Buffalo Exchange locations across the country will be collecting real furs in any condition. We then ship them off to wildlife rehabilitators, who use them to create a nurturing environment for injured and orphaned animals. Our friends at the center here got a deluge of coats this summer. They have always put stuffed toy animals in with some of their orphans, such as foxes. But the furs were better. In fact, Sanders was amazed how well the animals took to the furs, noting a bond that was formed between the baby mammals and donated items. After that story ran in the Pueblo Chieftain, a new donor got in touch with the center directly, hence our coat-transport. So if there is an unwanted fur coat in your house, contact Coats for Cubs, which maintains a list of participating wildlife rehabilitation centers around the country.